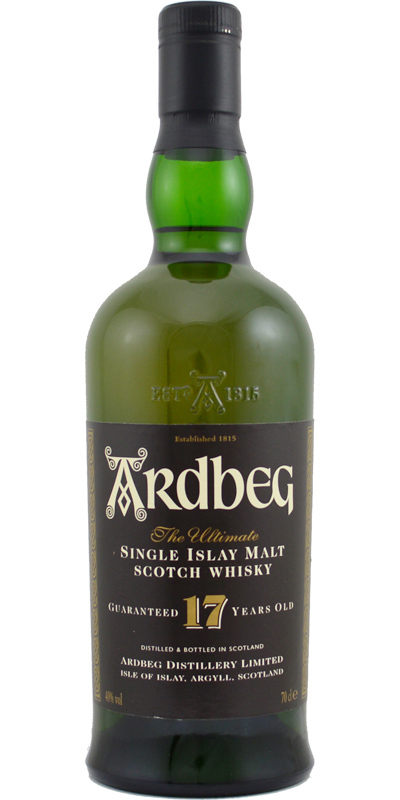 Easy to drink, but despite the 40% ABV, it's a powerful Ardbeg with a little smoke but enough complexity! Waxy apple, citruses, vanilla, sweet peat. Antique leather and salted caramel. Oily. Sweet peat, honey, vanilla, citruses and pepper. [Mai, 2015] I had this dram during an "Ardbeg Bicentenary" tasting at Bonn. Body : Medium, oily. Very firm. I have only one bottle. Assertive,briny, seaweed, tar-like. Hint of sulphur. Lovely. Peppery but also sweet. Cereal grains, oil, gorse. Tightly combined flavours. More mature and rounded,but still robust. Very appetizing. Oily. Lemon skins. Freshly ground white pepper. Very round and nice fruity. But not enough powerful. First a sweet maltiness with very little fine smoke. There is also some citrus. Keep fruity with a bit of heat. Very soft and round. A fruity sweetness. The smoke is as restrained as I have seen it in any other Ardbeg (except Blasda). Some apple. Amazingly, even in the aftertaste not the smoke dominates, but the oak comes to light, green and gentle. Good whisky. Very round and elegant. Grinded for my taste. The smoke and the squish of the 10 year old were taken a bit too strong.